Good grades are positive, right? The answer is not as straightforward as you might imagine. Internal strengths, like those listed above, are far more important to a life of success and well-being than whether a child earns an “A” on an Algebra exam or are accepted to a top-rated university. 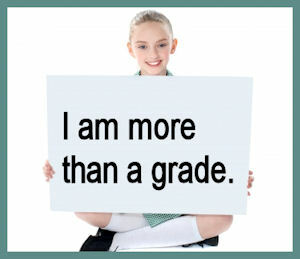 In fact, many tests only measure a student’s ability to produce a correctly memorized answer. For today’s learners, correct answers are not enough. And if we swallow the good grades pill in its entirety, students may suffer long-term consequences. By the time children reach late adolescence, their brains have the capacity to think about interrelationships, to explore the boundaries between fields of study, and to create new ways of learning. These critical abilities, fostered throughout childhood, will fuel tomorrow’s innovative technologies and create important social change. Despite a strong body of research on the value of internal strengths, we continue to use standardized, quantitative tests to measure kid’s success. Why? Because skills like critical thinking, curiosity, and collaboration are much more difficult to measure numerically across large populations. So we tend to measure what can most easily be measured – reading, math, and science knowledge. We do this, even though we know this type of measurement can cause harm to the health of our children. There has been a great deal of debate in recent years about the insatiable quest for good grades and test scores. The Search for a New Way to Test School Kids acknowledges the many problems, including those related to meeting the challenges of No Child Left Behind (NCLB). And of course, the Atlanta cheating scandal has reformers on each side of the testing issue pointing fingers at one another. A Teachable Moment from Atlanta’s Cheating Scandal offers salient advice, pointing out that we need to pay attention to the conditions that help students achieve. 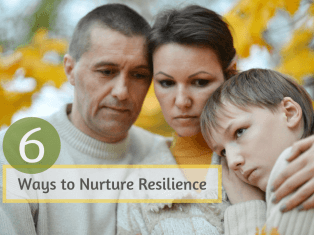 These conditions, like how children develop initiative, resiliency, and compassion are driving current research in the field of positive youth development. Whether or not you are a proponent of standardized testing or question the value of grades, there is a fallacy about good grades and test scores that leads many parents to become complacent, particularly when their child is doing well at school. Children succeed in life for many reasons; good grades do not guarantee success. The article, Thinking About Psychological Literacy, explains important aspects of success that are not measured by grades, like the ability to be self-reflective, action-oriented, and connected to work that improves the lives of others. These skills cannot be measured by numbers, nor are they easily compared through testing from one child to another. We may be living in an age that is obsessed with numbers, but that doesn’t mean we have to teach our children to measure their self-worth by good grades or test scores alone. In fact, parents, teachers, coaches, and other supportive adults are in a position to nurture psychological literacy and emotional intelligence, helping develop the internal strengths that determine a meaningful life. What is emotional intelligence? It’s about the connection we feel between body, mind, and spirit – and how we make sense of sensations, thoughts, and feelings. That connection is a critical aspect of social and emotional learning and in stimulating the brain’s neuroplasticity. When was the last time you helped a child identify and build on his or her character strengths? Have your grown children or students succeeded in developing the internal strengths listed above? What do you think contributed most to their success? Please share your comments.